Shelbie L. Wahl-Fouts is associate professor of music, music department chair, and director of choral activities at Hollins, where she conducts three choirs, ranging from beginner to advanced (Concert Choir, Chamber Choir, and Talmadge Singers). In addition to choral ensembles, her courses include Sight-Singing I/II and Conducting I/II. Wahl-Fouts has conducted numerous area VMEA/VCDA honor choirs, and is also a frequent festival conductor for All-City and All-County choruses. She has served as an adjudicator for Choral Assessments, and as a judge for multiple All-District, All-Virginia, and Honors Choir auditions. 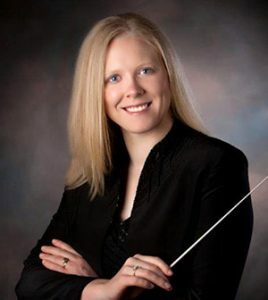 Wahl-Fouts received her Doctor of Arts in choral conducting from Ball State University, with a secondary emphasis in music education, and holds a Master of Music in choral conducting from Butler University and a Bachelor of Musical Arts in trumpet from DePauw University. Choral repertoire for women’s/treble voices is the primary focus of her research endeavors, having written for the ACDA Choral Journal and in the book Conducting Women’s Choirs. She also advocates for self-reflection and critical observation in the teaching of conducting, through immediate video feedback in the classroom. Her presentations and interest sessions include national and regional conferences of ACDA, as well as national conferences of the College Music Society and the Sister Singers Network, and MEA state conferences for Virginia, Maryland, and West Virginia. As a performer, she was formerly the accompanist for the Roanoke Valley Children’s Choir, having performed with them at 2014 ACDA Southern Division, 2015 ACDA National, and 2016 VMEA conferences. She currently serves as interim music director and conductor for the Valley Chamber Orchestra, and as Women’s Chorus Repertoire & Resources chair for Virginia ACDA. VMEA: 2017 District II Senior High Women’s Chorus (Virginia Beach); 2016 District IX 9th/10th Grade Women’s Chorus (Woodbridge); 2015 District VII Middle School Treble Chorus (Bristol); 2013 District VI High School Treble Chorus (Danville). 2017-present: Interim conductor and musical director for Valley Chamber Orchestra.